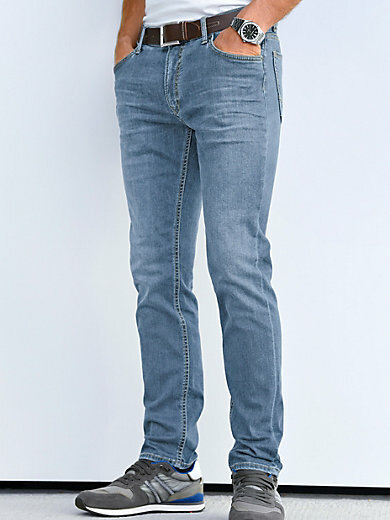 “Modern Fit” Jeans by BRAX FEEL GOOD – CHUCK: modern fit, narrow thighs and a low waist. A sporty 5-pocket design in a modern fit and trendy look. Highly elastic HI-FLEX denim combines authentic denim with the wear comfort of jogging trousers to create an authentic denim look, high elasticity, optimal freedom of movement, perfect fit and the ultimate wear comfort. Belt not included. 92% cotton, 6% elastomultiester, 2% elastane. Ankle width in size 50 approx. 37cm/15ins. The jeans are machine washable.